Kadence Systems Co. specializes in the design and production of Data Storage System components. Since its inception in 1993, Kadence has been providing state-of-the-art hardware, firmware and software solutions to data storage OEMs, system integrators and resellers. The founders of Kadence Systems have extensive background in the Hardware/Firmware development arena, particularly in the Data Storage System Design. While SCSI, Fibre-Channel, and EIDE are predominant interfaces on the storage peripherals side, a large number of connectivity options are available on the host side. As a small but growing company, Kadence has concentrated on niche markets within the data storage industry. 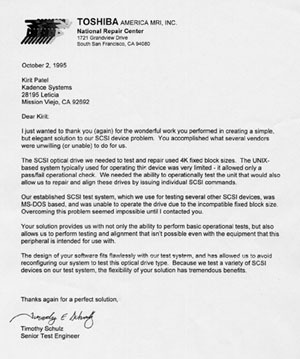 As such, Kadence has developed bridge products such as a Parallel to SCSI Converter, PCMCIA to SCSI Adapter, SCSI to EIDE, and, of course, SCSI to SCSI Expander. All these products require extensive firmware and software capabilities, not only to allow seamless communication of the host side protocol with the peripheral device side protocol, but also to allow inter-operability among third party host bus adapters (HBA) and their associated drivers with third party storage devices and peripherals. In addition to developing protocol conversion products, Kadence has also designed and produced state of the art LVD SCSI Backplanes (supporting up to 320 MB/S) , 2GHz Fibre Channel backplanes (with Port Bypass Circuitry), EIDE Backplanes and their associated hot-swappable adapter boards. Kadence's Associates have countless years of experience in Analog design as well, which has resulted in the development of various environmental monitoring cards. In applications such as the RAID units and NAS (Network Attached Storage) units, these cards not only provide status of such diverse parameters as voltage levels, temperature, cooling fan speeds, etc., but also of additional controls, hard and soft alarms, and, if necessary, graceful shutdown of systems to protect valuable data. Kadence fully supports and stands behind products developed for its customers. Over 80% of the OEMs for whom Kadence develops products end up trusting Kadence for their production needs. Over the years, Kadence has formed strategic alliances with local PCB Suppliers, PCB Assembly Houses, and, of course, Component distributors. With Kadence's in-house test and quality control processes, the net result is that the OEM customer receives the highest quality product at the most competitive rate, with full warranty and after sales support, all from a single source. Kadence has the ability and resources to develop specialized test equipment and test procedures, should those be required by the OEM Customer. If you are a data storage systems integrator or OEM, Kadence would appreciate an opportunity to talk to you. Whether your requirements are small or large, highly customized or industry standard, Kadence is prepared to provide you with the most efficient and economical solution. We guarantee it! To that end, this testimonial speaks for itself.